Although the nasal mucosa of the turbinates swells as part of the nasal cycle, outside agents such as infection, inhalant allergens, airborne irritants, and mucosal hyperreactivity can exacerbate the physiological swelling, necessitating a need for intervention. Either the osseous or mucosal portion of the turbinate may be hypertrophic. For example, patients who present with allergic rhinitis generally have a swelling of the mucosa, while patients with a severe septal deviation may present with a unilateral enlargement of the bony component of the turbinate. Knowing which portion of the turbinate is restricting airflow helps the surgeon determine which surgical techniques to use. Various surgical techniques are available to reduce the size of the inferior turbinate. This includes turbinectomy, turbinoplasty, extramucosal or submucosal electrocautery, radiofrequency ablation (RFA), laser-assisted resection or ablation, and cryosurgery. Most surgeons’ goals are to preserve as much turbinate mucosa as possible while removing as much inferior turbinate bulk as possible. This allows normal turbinate mucosa physiology to continue. The lateral nasal walls contain 3 pairs each of small, thin, shell-like bones: the superior, middle, and inferior conchae, which form the bony framework of the turbinates. Lateral to these curved structures lies the medial wall of the maxillary sinus (see the image below). Lateral nasal wall anatomy and paranasal sinus ostia. Inferior to the turbinates lies a space called a meatus, with names that correspond to the above turbinate, eg, superior turbinate, superior meatus. The roof of the nose internally is formed by the cribriform plate of the ethmoid. 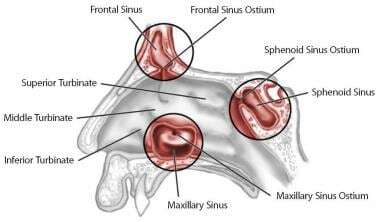 Posteroinferior to this structure, sloping down at an angle, is the bony face of the sphenoid sinus. Turbinectomy is a partial or complete resection of the inferior turbinate with or without the guidance of an endoscope. The microdebrider instrument is often used in this procedure in order to remove some of the soft tissue component, and the debrider can be used even in the more complex cases of bony hypertrophy. The exposed raw mucosal edges and bone from this procedure may lead to nasal crusting with need for postoperative debridement. The mucosal edges may continue to bleed despite electrocautery control and nasal packing may be needed for hemostasis. Some evidence exists that turbinectomy may lead to a high incidence of empty nose syndrome. However, the evidence is conflicting, and results seem to be quite operator dependent. Radiofrequency ablation (RFA) is a very common thermal technique in which a thermal probe is physically inserted into the inferior turbinate and the delivered radioenergy removes some of the tissue. This technique has the advantage that it can be done in the office setting under local anesthesia and it has rare and minor complications. Studies show that RFA has better outcomes than placebo surgery. Since the surgery is relatively noncomplex, it can be seen as an attractive option for people with minor inferior turbinate airway obstruction who are seeking a surgical option. Patients tend to have recurrences with RFA, but since it is a clinic procedure, recurrences are easily treated in the clinic. RFA creates an ionization of submucosal tissue that subsequently leads to a scar that reduces the bulk of the surrounding tissue. Although fibrotic tissue replaces the glands and venous plexuses, nasal mucociliary function remains preserved. The mucosal surfaces should not be involved. Inferior turbinate reduction for nasal obstructive symptoms caused by enlarged turbinates is a useful procedure. It is not a complex surgery and, depending on the patient’s needs, the procedure can be done in the clinic or operating room setting. Generally, turbinate reduction is a safe procedure with minimal morbidity issues. An otolaryngologist who knows several methods of turbinate reduction will be able to help most patients with significant nasal obstruction issues. It can be done in combination with other airway surgery such as endoscopic sinus surgery, septoplasty, and multilevel treatment for obstructive sleep apnea. Patients who live in a dry or dusty environment may not be good candidates (relative contraindication). Decreased surface area from the loss of some inferior turbinate mucosa can possibly predispose patients to dry nasal mucosa. This may lead to crusting and obstruction issues. Although radiofrequency ablation is a simple technique, evidence exists that the short-term relief is significant. Garzaro et al reported on a 2-year follow-up, noting that patients experienced continued improvement in olfaction, subjective and objective improvement in nasal congestion, and improvement in overall quality of life. Leong SC, Eccles R. Inferior turbinate surgery and nasal airflow: evidence-based management. Curr Opin Otolaryngol Head Neck Surg. 2010 Feb. 18(1):54-9. [Medline]. Hol MK, Huizing EH. Treatment of inferior turbinate pathology: a review and critical evaluation of the different techniques. Rhinology. 2000 Dec. 38(4):157-66. [Medline]. Hanif J, Jawad SS, Eccles R. The nasal cycle in health and disease. Clin Otolaryngol Allied Sci. 2000 Dec. 25(6):461-7. [Medline]. Farmer SE, Eccles R. Chronic inferior turbinate enlargement and the implications for surgical intervention. Rhinology. 2006 Dec. 44(4):234-8. [Medline]. Bhandarkar ND, Smith TL. Outcomes of surgery for inferior turbinate hypertrophy. Curr Opin Otolaryngol Head Neck Surg. 2010 Feb. 18(1):49-53. [Medline]. Ozcan KM, Gedikli Y, Ozcan I, Pasaoglu L, Dere H. Microdebrider for reduction of inferior turbinate: evaluation of effectiveness by computed tomography. J Otolaryngol Head Neck Surg. 2008 Aug. 37(4):463-8. [Medline]. Chhabra N, Houser SM. The diagnosis and management of empty nose syndrome. Otolaryngol Clin North Am. 2009 Apr. 42(2):311-30, ix. [Medline]. Batra PS, Seiden AM, Smith TL. Surgical management of adult inferior turbinate hypertrophy: a systematic review of the evidence. Laryngoscope. 2009 Sep. 119(9):1819-27. [Medline]. Tanna N, Im DD, Azhar H, Roostaeian J, Lesavoy MA, Bradley JP, et al. Inferior turbinoplasty during cosmetic rhinoplasty: techniques and trends. Ann Plast Surg. 2014 Jan. 72(1):5-8. [Medline]. Schumacher MJ. Nasal dyspnea: the place of rhinomanometry in its objective assessment. Am J Rhinol. 2004 Jan-Feb. 18(1):41-6. [Medline]. Eccles R, Jawad MS, Jawad SS, Angello JT, Druce HM. Efficacy and safety of single and multiple doses of pseudoephedrine in the treatment of nasal congestion associated with common cold. Am J Rhinol. 2005 Jan-Feb. 19(1):25-31. [Medline]. Garzaro M, Pezzoli M, Landolfo V, Defilippi S, Giordano C, Pecorari G. Radiofrequency Inferior Turbinate Reduction: Long-Term Olfactory and Functional Outcomes. Otolaryngol Head Neck Surg. 2011 Sep 20. [Medline]. Tanna N, Lesavoy MA, Abou-Sayed HA, Gruber RP. Septoturbinotomy. Aesthet Surg J. 2013 Nov 1. 33(8):1199-205. [Medline]. Gupta A, Mercurio E, Bielamowicz S. Endoscopic inferior turbinate reduction: an outcomes analysis. Laryngoscope. 2001 Nov. 111(11 Pt 1):1957-9. [Medline]. Lee JY, Lee JD. Comparative study on the long-term effectiveness between coblation- and microdebrider-assisted partial turbinoplasty. Laryngoscope. 2006 May. 116(5):729-34. [Medline]. Vijay Kumar K, Kumar S, Garg S. A comparative study of radiofrequency assisted versus microdebrider assisted turbinoplasty in cases of inferior turbinate hypertrophy. Indian J Otolaryngol Head Neck Surg. 2014 Jan. 66(1):35-9. [Medline]. [Full Text].